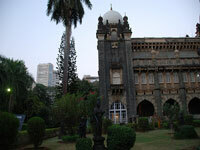 The Prince of Wales Museum, now officially known as the Chhatrapati Shivaji Maharaj Vastu Sangrahalaya, was founded in the early 20th century to commemorate the visit of (eventual King of the United Kingdom) George V. The museum houses more than 50,000 exhibits of ancient Indian history, as well as artefacts from other lands. The museum's greatest areas of focus are art, archaeology and natural history. The Indus Valley Civilisation section is particularly impressive. The museum is surrounded by a lovely garden, which provides a nice area to stroll in after exploring the exhibitions. The building dates back to 1914 but it was originally used as a military hospital and only housed the museum in 1922; it is an acknowledged architectural gem of the city. There is a cafe where visitors can buy refreshments and it's fun to enjoy them out in the garden. The museum's collection is fairly large so it will take a few hours to see everything. Students should be sure to take their student cards along because the concession for foreign students is substantial. There is no air conditioning in the building so rather don't visit in the midday heat. Visitors are allowed to take photographs, but there is an additional charge to take in a camera.